Below are Box Office Collection report of bollywood film Rangoon With his budget and total box office collection status. Also including of the film. Rangoon movie lead star cast is Kangana Ranaut, Saif Ali Khan, Shahid Kapoor. 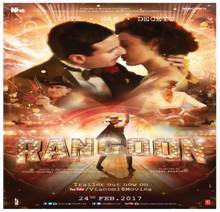 Rangoon is an indian romantic, war drama film of 2017, directed by Vishal Bhardwaj & produced by Ashish Paul, Vishal Bhardwaj & Viacom 18 Motion Pictures. Review: Modelled on the stunt queen Fearless Nadia, Ranaut’s is the stand out performance. Her body language is spot on and some of her action sequences are thrilling, even if you can see the computer graphics mile off. And she gets one spectacular speaking moment. The camera tight on her face, when she speaks of love and desire and heartbreak.